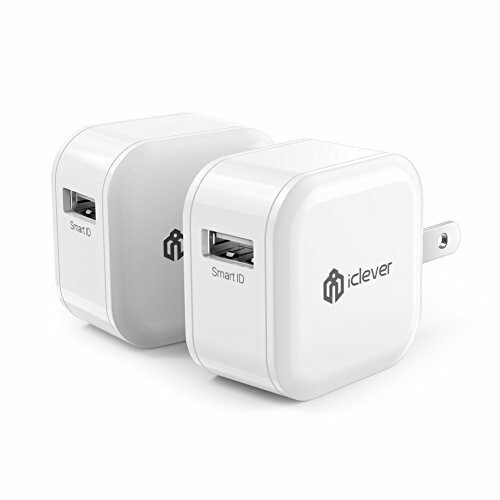 iClever Boostcube 12W 2.4A USB Wall Charger 2-Pack Mini Travel AC Adapter for iPhone X/8/7/7 Plus/6S/6 Plus, iPad Pro Air/Mini and other Cell Phone, Tablet by iClever at All Company Mobiles. MPN: IC-TC05-W. Hurry! Limited time offer. Offer valid only while supplies last. Charge Your Device At Record Time!If you're always looking for a plug to charge your phone, then our double charger is the perfect solution for you! If you're always looking for a plug to charge your phone, then our double charger is the perfect solution for you! Now you can charge two electronic devices using just one plug! It's easy, fast, and can maximize the charging efficiency, so your phone will be charged in half the time, thanks to its smart ID Technology! Because it's small, lightweight and can easily fit in the palm of your hand, it's perfect to take with you when travelling. The plug folds upward for safer carrying. It has a 12W 2.4A power capacity and a 100-240V input worldwide. -LG G5, Optimus F3, Nexus 5 6 7 9 10, Motorola Droid RAZR MAXX, Blackberry and more! It can also charge External Battery Pack, GPS, PSP, PS4 Controller, Bluetooth Speaker/Headphones, Mp3 Players, and USB Powered Devices. It has an input of AC 100~240V 50/60Hz, an output of 5V 2.4A max, it's 1.57x1.57x1.12 inches big and weighs 42.9 g.
Inside The package you will find 1 iClever BoostCube 1-Port USB Wall Charger, 1 User Manual and 1 Warranty Card. Charge Your Device Faster With Our 1 Port USB Charger! Be Quick, Before We Run Out Of Stock Again!